We met Bozi and Martina in 2013 when we were all travelling in Ecuador. We became fastfriends, and lucky for us, it stuck. We were also lucky to be meeting both Bozi and Martina in Chemnitz, Germany, where Bozi lives. We were really looking forward to seeing them again! With Bozi acting as our knowledgeable tour guide we explored Chemnitz, the surrounding countryside and Dresden. We picnicked by the lakes, discovered a mini castle, ate lots of ice cream, tasted the local brew and got and insiders view on Eastern Germany. 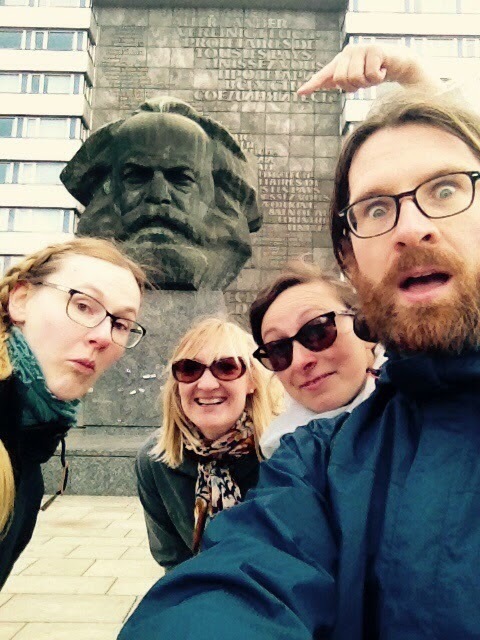 Plus, Chemnitz used to be called Karl Marx Town (even though he had never been there) so we got to see the world's biggest sculpture of his head! This is him, photo bombing our group picture! It was a super fun weekend in two beautiful German cities with two great friends. The only bad thing was that it was over too soon! Cesky Krumlov is a smallish town, three hour bus ride south of Prague. Triposo, my new favourite app, led us right to our hostel from the bus station in less than 10 minutes. Not that we minded walking. It was the most beautiful Spring day of 2015. Everything was coming up roses; almost literally. The cherry blossoms were out, trees actually budding green, not a whisper of snow to be seen! Our hostel, Kromlov House, is amazing. One of best places we've stayed, ever. Its an old building that was once a bakery and then a quarantine house for those wanting to enter the city, so to make sure those travelling folks didn't have the plague, or any other nasty ailment. And now, its a super atmospheric spot built around a huge two story brick oven with old wooden doors, brass latches, hand hewn wood furniture and lots of great character. The owners told us that when they bought the house nearly twenty years ago, the roof was falling in and the whole house was in shambles. When outsiders were finally allowed back into the Czech after the Wall came down, many of its towns were all but deserted. In fact, Cesky Krumlov itself was practically taken over by forest. Trees were growing out of rooftops, buildings were abandoned, windows broken. It sounds like it was a veritable ghost town. Thankfully the potential of the beautiful city wasn't ignored. Today, it is the Czech's second biggest tourist town. 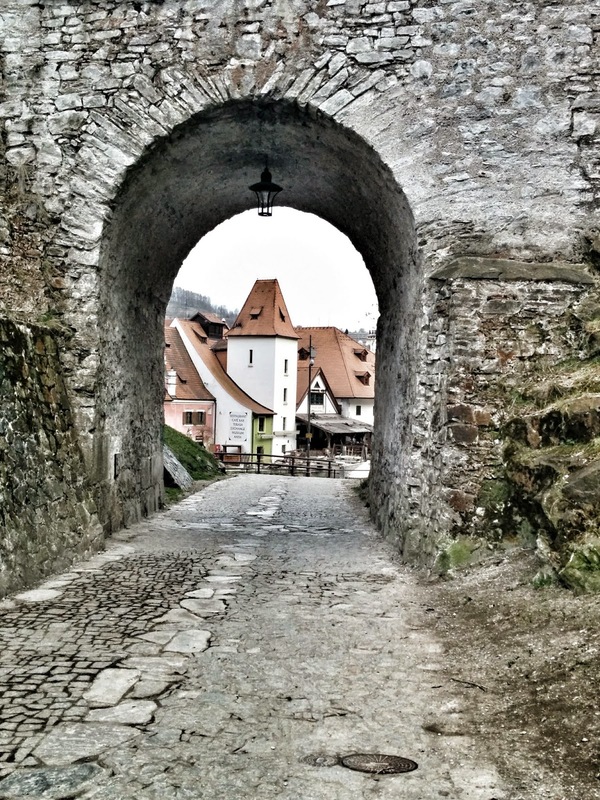 Cesky Krumlov was stolen straight from a fairy tale. Or, maybe all fairy tales were set in Cesky Krumlov. Either way, you get the idea. Visiting mid-week, in April was perfect. We were able to experience all the atmosphere with very few other tourists. We had perfectly warm, sunny weather. Conveniently, Cesky Krumlov has a seemingly endless number of terraces, patios and balconies from which to enjoy said weather. Often we were accompanied at these locations by an excellent Czech beer. Sometimes also with a Czech staple, fried cheese, and one special afternoon we even indulged in some local layered honey cake. 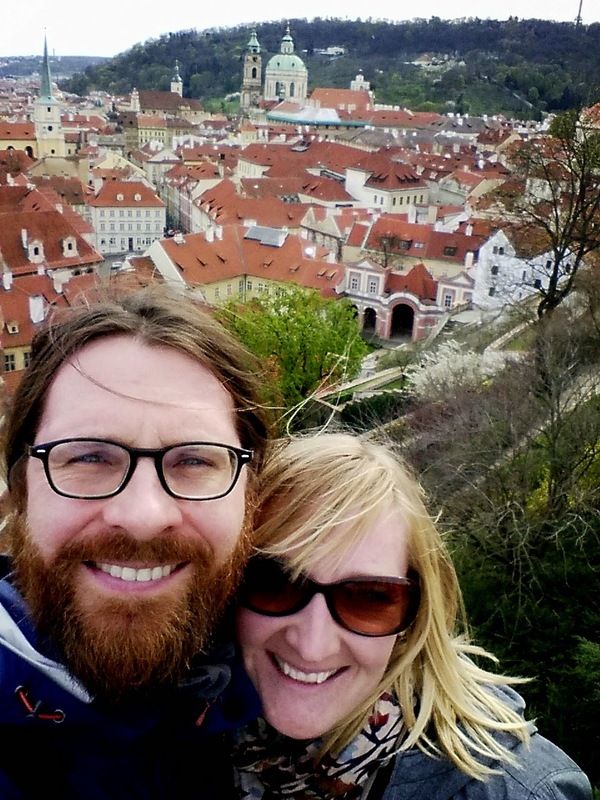 It was J who was lucky enough to celebrate his birthday in Krumlov. 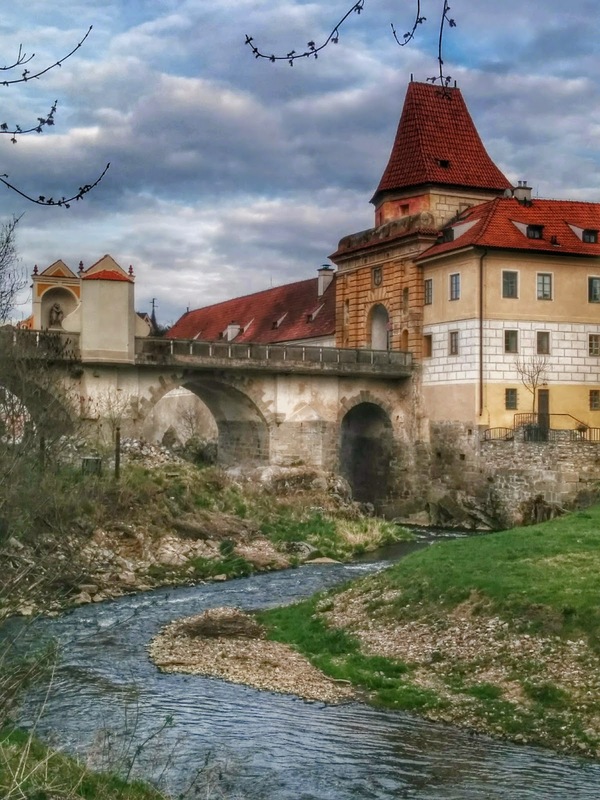 We hiked to a hill overlooking the town and were rewarded with spectacular views of the town with all its red roofs, the river that hugs it, and the rolling countryside rising up on all sides of Krumlov, as if to try and hide its secret down in the valley. We splurged on a traditional banquet with a mug of sweet mead. The restaurant's terrace was overlooking the rushing river and there were even fleece blankets to cuddle into as the sun fell behind the town castle. J made 'birthday decrees' like 'You shall not feed the stray cat the ham from your plate,' and “Thou shall not punch the birthday boy on his birthday.” Because it was hisbirthday I had no choice but to bow to his unreasonable demands. Poor cat. Krumlov was adorable during the day, but it was down-right-magical when the sun went down. If there was a picture beside the definition of a Romantic Evening Stroll, it would be of one of the countless bridges and alleyways that wind their way through Krumlov. You could hardly blame me for insisting that we meander around just one more cobbled corner. Private room with a private bathroom 1,000 czk per night. I was enamoured by Prague almost the moment we arrived. I'm not sure if it was because we had been waiting so long to get here.. or if because almost immediately upon arriving, we started in on a local tradition... of beer tasting. 'Where beer is good, life is brewed,' No. Wait. 'Where beer is brewed, life is good,' or so goes an old Czech proverb. Either way, after sampling some local Czech beer, I had a whole wad of insightful opinions about the city we had been in for less than five hours. J was lucky enough to hear them all on our moonlit stroll home from the Micro Brewery. But with choices like coffee, banana and nettle beer you kinda have to try them all. But don't worry: According to the Czechs themselves, Czech beer is so pure that it is virtually impossible to get a hangover after drinking it. Its always good to think positively. Prague, to me that night, was a juxtaposition of soft elegance and bold change. Beautifully detailed, brightly painted buildings topped with red roofs, next to concrete slabs covered in graffiti. A Vietnamese pho shop next to a traditional eatery. Grey communist-era buildings beside the KFC. So many painstakingly restored buildings in a city with a long, fascinating history. 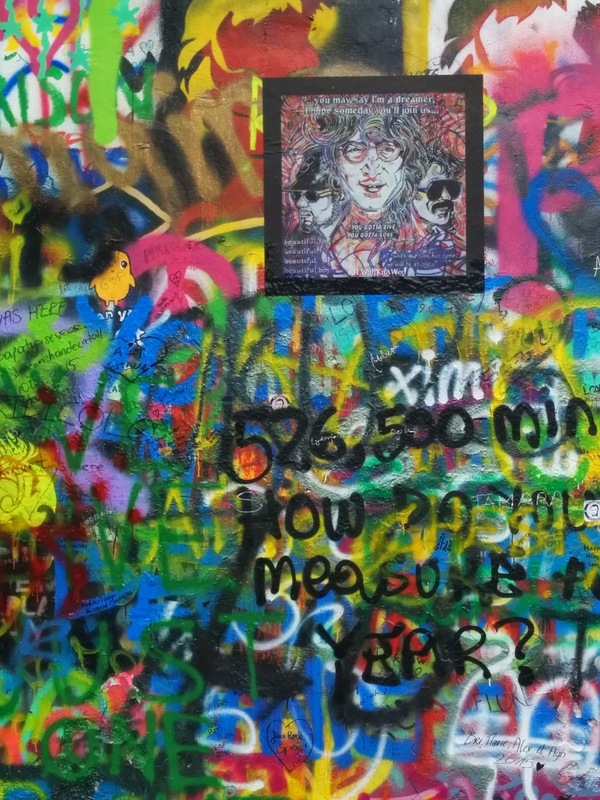 Prague was built up in my head and I was worried that it couldn't live up to my imagination. But finding the cobblestones, the narrow alleys, the massive ornate buildings hiding themselves around each corner, the Prague Castle reflecting in the river, the mellow glow of street side lanterns making every step oh-so atmospheric. Prague was magic. Fast forward to the next day at noon. Standing in front of the Astronomical Clock on the Old Town Tower, in the Old Town Square. Aka. Tourist Central. The clock performs a forty-five second mechanical display with four characters playing a part: Death, Greed, Vanity and Pagan-Invasion (the biggest fears of 15th Century Prague-ites) essentially a giant cuckoo clock of sorts. “This is THE MOST touristy city in all of Europe,” I exclaim to J. Its jammed. With a bunch of tourist gawking at the clock. I get the feeling that most of them aren't sure why they're there. They just know they're supposed to be. I can't really be annoyed about that, though. I'm standing there too; watching the (rather anti-climatic) astronomical clock strike noon. I feel a bit bad for the clock. A quick duck down a side alley and the tourist crush disappeared- another shot of Prague magic. Stray one street away from the wax museums and key chain emporiums- and you lose 75% of the tourists. Definitely those following the tour-guide-lady with the stuffed turtle taped to the top of her umbrella. A breath of air (and some warm Trdelník, a sort of sugary/doughy dessert) and I'm in love with Prague again. I am also in love with this new travel app I downloaded called “Triposo.” You can download a city map, along with food, accommodation and activity recommendations. And the map is so detailed. It is like coming out of the dark ages of LP cartography. Seriously. Then, on your handy dandy smart phone you can use your GPS and find your way around super easily! Gone are the days when we're standing on a street corner arguing! Hello happy travel partner! Prague is street after cobblestone street of photogenic Eastern/Central Europe. The Prague Castle, all fairy-tale-like, looms over the city and offers sweeping views to those who huff up the hill (as well as those who took the funicular- but they didn't really earn it, now did they?) Then there's St. Charles Bridge, where legend has it that in 1393 a priest (St John of Nepomuk) was tossed off by King Wenceslas IV (...not good King Wenceslas who looked out on Boxing Day) for refusing to divulge the Queen's confessions. Legend also has it that gold stars in the halo of his statue followed his corpse down the river. Now his statue has a bronze plaque at the bottom of it. Yet another tradition is that if you rub this plaque, you'll return to Prague one day. Who doesn't love a good tradition? Speaking of tradition, lets bring this blog post full circle: The age old Czech tradition of beer drinking. According to our guidebook, Czechs drink more per capita than ANYONE else in the WORLD. Around 150L per person, per year! There is no doubt that there are certain consequences to the reality of that statistic, but I digress. With a brewing tradition that goes back nearly 1000 years, the Czechs have really had time to perfect lager. Or Pilsner, if you prefer. Pilsner was actually developed here in the Czech, in the town of Plzen. So there's a fun party fact. Prague has a lot to see. Its especially hard to get through all the serious sightseeing when every other street boasts a refreshing beer intermission. But wait- there's the Prague Beer Museum. This is no museum, I admit. Just a tricky name to ease a bit of the sight-seeing guilt as you watch the glass of time drain to half full. All you while trying to decide which of the 30 beers on tap to taste! Plus, we were at a Beer Museum after all, one should expect to learn something. For example, I learned that while beers in the Czech are labelled by degrees- temperature is not actually what the little degrees symbol is indicating. Its actually some complicated system that doesn't relate at all to the temperature the drink is served at, nor directly to the percentage of alcohol in the beer, but its “an indicator of specific gravity known as a 'Balling' rating.” Ok, so I didn't actually learn that. I copied it directly from the guidebook. I stopped trying to understand after the words 'gravity' and 'beer' were in the same sentence. But, thankfully we have smart friends: Thanks, Lasse! Anyways, I can tell you who was going to forget everything that they learned that afternoon. That would be the four German twenty-somethings who rocked up to the bar and proudly declared as they clinked their first foamy glasses, that they were going to work their way through ALL 30 beers that the Prague Beer Museum had on tap. Cue us leaving. tap water (as labelled on the menu) cost an extra $1.50; bread that is delivered to your table (even if you don't order it) is then charged to your bill; and beer is listed by some out-of-the-ordinary number that is indirectly related to the alcohol percentage in the beer, but not solely or accurately stating the actual alcohol percentage of the beer. Weird, isn't it? Anyway, lots of things to remember. Our receptionist suggested we try 'Cafe Louvre', as it was her favourite. Plus, it was across the street- and I was hungry! The atmosphere was amazing. Huge windows overlooked the street from the second floor seating, sparkly chandeliers hung low and big mirrors reflected the light around the room. Victorian style trim and wallpaper gave the space an undeniable elegance and with the antique cash register on the counter, I felt like I was walking into a different time. We ordered traditional Czech dishes. J got fried cheese dumplings in a mushroom sauce and I ordered chicken breast in a roasted red-pepper sauce with spaetzle (a yellow, thick, delightful pasta). The plates were attractively arranged and both the food (including the Prague tap water and bread) were delicious. In the middle of our meal a very old lady came over to our table came over to our table and gave me a great big hug. She didn't speak a lick of English, but from what I gathered she was from Dubrovnik and I was from either Germany, England or the Netherlands. She seemed very happy that we were here and I was happy that she was happy (and also because I was eating delicious food). J said he had smiled at her a few times over the course of our supper... maybe that's why she wanted to talk/hug! Sadly, and as expected, I had filled up on the (not) free bread, and only finished half my meal. Not wanting to waste (and thinking it would be a tasty breakfast) I wanted to bring my leftovers back to the fridge at the hostel. But, were leftovers a thing in the Czech? There were so many rules, and with the 'double double' misunderstanding yesterday - maybe leftovers were just a Canadian thing too?! Who knows. Apparently there are a lot of things this so-called 'School of Life' hasn't taught me. I don't think in all of our travels, I have ever had leftovers after a meal out... That and the fact that this was quite a fancy restaurant (again abnormal for our travels). Would they be offended if I asked for a takeout box? The amount of time I spent pondering this, and the fact that I'm now writing a blog about leftovers is pretty ridiculous. But in a fun way- right? Anyways. I tried to eat more- thereby eliminating the need for me to ask the left-over question at all. But I really ate a lot of that (not) free bread, and I was stuffed to the gills. Our server came over to collect J's empty plate. She looked at mine. I sucked it up and asked, 'Is it possible for me to bring this home?' gesturing obviously at my food. She looks at me for a solid ten seconds without saying a word with a confused look on her face. I'm assuming she's trying to decide how to tell me in English what a silly proposition I had just made. She is still staring at me. 'The food? Yes!' she exclaims, as if I had asked her if this particular Czech restaurant served beer, 'Of course!' Turns out she was just trying to decide whether I was actually an idiot-or just blonde. Either way. I had leftovers for breakfast, and that is all that really matters. It's so nice to be back across the pond! Double-Double A Canadian term used to describe how you take your coffee - two teaspoons of sugar and two creams. Preferably used in any Tim Hortons location. Server at your local coffee shop: Can I take your order? You: Ya, I'll have a medium double-double.